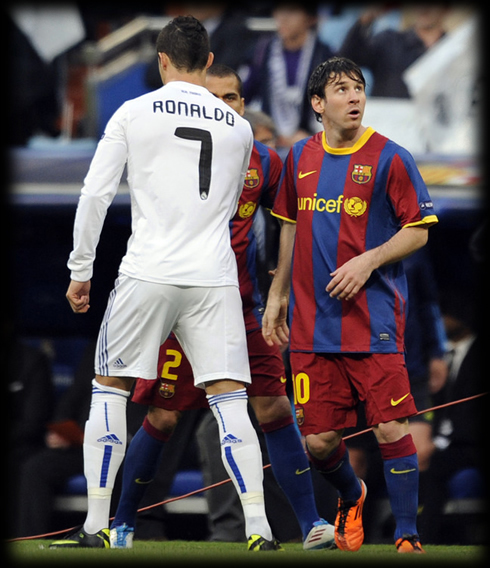 Real Madrid was defeated by Barcelona by 0-2 in the Santiago Bernabeu. The match had a twist after the German referee Wolfgang Stark decided to send off Pepe, with a direct red card. Cristiano Ronaldo didn't got many chances to attempt to score tonight and Real Madrid will now attempt a miraculous comeback in the Camp Nou next week. Real Madrid played their third "Clasico" against Barcelona this month, as well as the team was reduced to ten men for the third time in three matches. First it was in Spanish League, when Real Madrid played without Raul Albiol for more than 40 minutes. Then, it was time for Di Maria being sent off in the closing minutes of the Copa del Rey final. And tonight in the UEFA Champions League, Pepe headed to the showers following a harsh red card that tilted the outcome of the match by making things easier for the "Blaugrana", as well as the tie in Barcelona's favor. Despite the poor performance by the referee, Mr. Wolfgang Stark, Real Madrid will travel to Barcelona next week in a show of courage and hoping for a miracle. This club is noted for its ability to make the impossible possible. This is Real Madrid and with this spirit it will travel to the Camp Nou in an attempt to turn around a tie that many might consider hopeless. The first half opened as most predicted. Real Madrid gave Barcelona room to work with and possession of the ball, even though Andres Iniesta didn't play due to muscle injury. The "Merengues" attempted to play in counter-attack, hoping that Angel Di Maria or Cristiano Ronaldo could steer towards Victor Valdes. Pep Guardiola's team played quite conservatively and despite the possession, they were unable to find open looks on Iker Casillas area. David Villa and Xavi had chances to give the visitors the lead, but the "El Guaje" shot went wide and Casillas got a hand to the midfielder's strike. A shot from distance by Cristiano Ronaldo close to the halftime, troubled Valdes, but the goalkeeper cleared as best he could, with half of neck and face stopping the shot. Mesut Ozil was replaced by Adebayor after the restart in search of more offense and a go-to guy in attack. As Real Madrid closed in on Victor Valdes box and Barça appeared to be losing steam, the German referee Wolfgang Stark, somehow stole the spotlight when he decided to send Pepe off by showing him the red card around the 61th minute. José Mourinho's prediction once again came true and Real Madrid were again reduced to ten men against Barcelona, but this time in the UEFA Champions League semi-finals. José Mourinho was then sent off as well and Real Madrid fell back in an effort to maintain the clean sheet. Barcelona, who had yet to get a good look on goal, began to dictate the tempo and Lionel Messi put the team on his shoulders and scored two goals for Pep Guardiola and company. The Argentine player capitalized off an assist by Ibrahim Affelay for the first, and with Real Madrid having no answer against a numerically superior team, they just got knocked by Messi again in the second goal, following an amazing individual play. The first leg of the tie came to a close 0-2, forcing Real Madrid to pull off a true miracle during their visit to Barcelona if they want to keep the UEFA Champions League dream alive. After the match, José Mourinho showed his disagreement with the referee and left a few warning notices: "I don't know why this happens. Barcelona are trule a fantastic team, but I still don't understand why Pepe was sent off. That basically destroyed us tonight and allowed Barcelona to win the game." The "Special One" then added: "I didn't say anything to the referee. I just laughed and applauded his decision, but I didn't say anything. At this point, I prefer not to say anything else, because if I speak what I think, my career will end right here and now. And because I can't say what I think, I'll just leave a few questions. Why? Why Ovrebo? (the referee from the match Chelsea vs Barcelona in 2009) Why Bussaca? Guardiola is a great coach but he won a Champions League that I would be ashamed to have won. We are talking about an truly fantastic football team, but why couldn't Chelsea reach the final two years ago? It was a miracle that Inter reached the final last year. Why kill a tie/draw that could well end 0-0 after three hours? I don't understand why." Remember that you can watch Real Madrid vs Zaragoza livestreams, for the Spanish League, online here on ronaldo7.net, this Saturday. Cristiano Ronaldo may rest for the UEFA Champions League 2nd leg, to be played next week.